Many people like to make their own handsVarious crafts. Materials for them can serve almost anything. 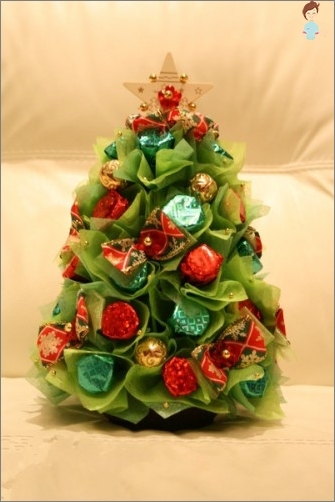 So, for example, you can make from tasty candies delicious bouquets, cake, pineapple and even a Christmas tree. With the help of simple techniques, you can create flowers that are visually no worse than these, and they will smell like bouquets with chocolate and caramel. 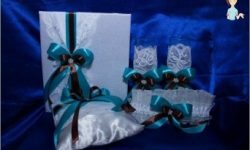 If on any of the holidays you wantSurprise a person dear to you, then be sure to find out how to make such unusual gifts from sweets. Sweet in the truest sense of the word roses will please no less than real. In addition, they do not wither ... until they are eaten. The simplest crafts are sweet flowers. Initially, it may seem that it is very difficult to make roses from paper so that they look like fresh flowers. In fact, this requires a minimum of effort and a small amount of materials. How to make flowers from paper and candy? The principle of manufacturing each piece is common for almost all models. These flowers are the easiest to make. First of all, you need to fix the sweets on a bamboo stick. We stick one end of the wrapper with adhesive tape. If you work with round candies in foil, you can wrap them in a film, and fix the ends on a stick. Corrugated paper, for example, pinkWe cut out petals for tulips. Each flower will need 6 oblong petals. We fix them around the core-base with the help of thread: inside - 3, outside - also 3, overlapping joints. We form the petals: On top and roughly center of the paper you need to stretch out a little and bend. We glue the PVA with the tips of the petals to each other. We clip the leg with a strip of green paper, glue the leaf. The rest of the crafts are done in this way. The difference is only in the number and shape of the petals. In order to create roses you need to cut outPaper, for example, red, round petals, not less than 10-15 pieces. We bend them and make the edges slightly wavy. We glue them around the candy core in turn, starting with the smallest, forming flowers. The leaves are carved in a heart-shaped form and we make denticles along the edges. These flowers are also very easy to make. It is better to make a heart made of chocolates with a yellow wrapper. From a white paper we cut out many oblong pointed petals. We glue them in two rows on a stick. Slightly curl, revealing the center of the daisy. The leaves are cut out oblong with small denticles along the edges. These flowers are made a little differently. In addition, a green wire is required. From yellow paper we twist small yellow balls, inside of which we put nuts or small pellets. We put them on the wire, forming inflorescences. Cut out the leaves with a thin "Herringbone". After the flowers were made, you canTo shape the bouquets themselves. You can collect them with an armful and wrap it with colored film, paper or floral net. But a more interesting option is to combine sweet souvenirs with real live colors. 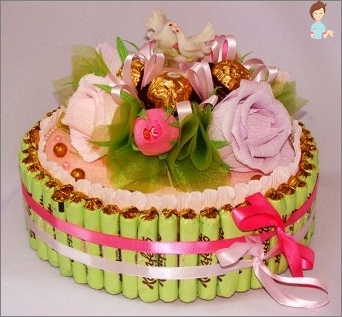 Sweets are best placed in the center, having fastened the ends of the sticks together with a thread or wire. Insert fresh flowers between the paper and the edges of the bouquet. 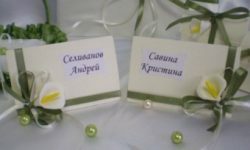 Their legs should be longer than bamboo sticks, so that the bouquet can be safely put in water and do not wet homemade elements. Another option - bouquets in the basket. Cardboard can be used as a basis. Fasten it slightly above the bottom of the basket and make holes in it. Insert in each of them delicious gifts, and from above tie the entire composition with tape so that under the weight of the candies it does not fall apart. Cardboard disguise with beautiful paper or tinsel. Such a present will be an ideal option by March 8 or birthday. Cake is an essential attribute of this holiday. Without him, not a single birthday is enough. The real sweet tooth can be pleased by building a cake from his favorite sweets. How to make a festive cake of chocolates? You can make such a cake in different ways, butThe most interesting, perhaps, is the following. First you need to make a foundation. Cut out the circle and make a cut before the bottom line. Bend the edges, glue on the cuts. It turns out a round box. Cut out the lid. If you form a neatly round shape to you hard, you can simplify the process and use a ready-made square box. Now we paste the cake with beautiful wrapping paper both from the outside and from the inside. At the edges of the box pasted with bars. Inside we fall asleep candies, cookies, dragees and other sweet gifts. Cover it all with a lid and tie it with a ribbon. On top of the cake can additionally decorate. By the way, if you have already tried to make sweet bouquets, you can make roses to decorate the lid of our crafts. A huge plus of such a dessert - it can be eaten little by little and very long. A very interesting variant of the craft is sweet pineapple. Do it best of chocolates, wrapped in golden foil, to visually bring a resemblance to real fruit. First you need to prepare the foundation. It can serve as a bottle of champagne or wine. Firstly, it is an ideal addition to sweets, and secondly, its shape a little like pineapple. You can take a regular pet-bottle. Degrease the surface of the substrate. Now one should stick the candy with a gun. The last row should be at the label level on the neck. Next, the pineapple should dry out. At this time, you need to prepare a green tip. From the tape or paper, oblong pointed tiny leaves are cut out. We glue them the neck of the bottle. Scissors turn the leaves. Pineapple is ready! You can procure such symbolic gifts if you like to visit friends. In childhood, many loved the holiday was the NewYear and the reason for this are not gifts. Often on the New Year tree, parents hung up delicious toys: tangerines, cookies, candies. And what if the last and make the Christmas tree? How to make a tree of rain and candy? It is best to use quick-dryingHot-melt adhesive. First, we form the Christmas tree itself. To do this, turn a sheet of cardboard into a cone and glue it together. Now with the help of a gun we attach candy to the cardboard base. We glue the entire area of ​​the cone from the bottom up. After that we wrap the cardboard with rain, which simulates green needles. On top of it we adorn our beautiful garland. Now you can put decorative gifts under it. You can make a Christmas tree on the same principle asPineapple using a bottle of champagne. 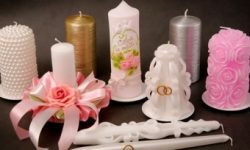 Another option, especially relevant in the event that sweets are wrapped in candy-bows: wrap a cardboard cone, and sweets hang on a string, prikolov them to the basis with the help of needles. As you can see, doing various crafts made of chocolatesVery simple and exciting. In addition, these are magnificent gifts for any occasion. On birthday you can make a cake, for a new year - a Christmas tree, for a party - pineapple. A delicious bouquets will please every girl, because the best colors can only be sweets! 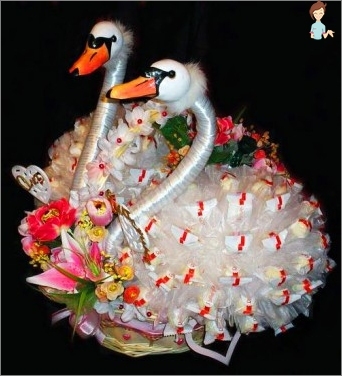 You can do such crafts with the children, they will surely like it very much.